We realised earlier this year just how long some people have helped us to look after our customers and thought we should thank them for all their hard work and commitment. 35 years - Way back in January 1977 Paul Knights joined us as an installer of our shelving,partitioning, benches etc (just 18 months after my father started the business), before coming into the office in 1999 to take over the Projects department. 25 years - Stuart Ambrose joined in July 1987 specifically to take over the running of the Warehouse. 23 years - Margaret Smith joined in February 1989 to take over in accounts. 10 years - Glynis Coombes joined in June 2002 to help us in sales and order processing not long after we started selling online. And last but not least another 10 years for Mark Wilson who also joined us a little later in 2002 from one of our competitors as an estimator for all our industrial products, and now is our Sales Manager. 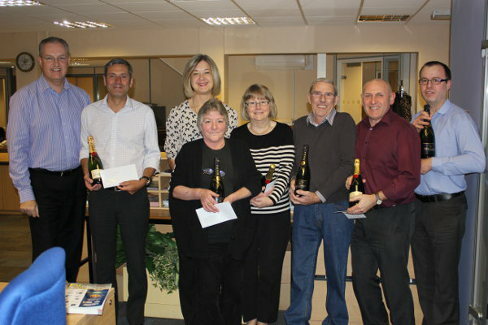 They were all given a bottle of Moet Champagne and a range of gift vouchers. Managing Director, Simon has also worked for ESE since March 1984 (28 years) and his wife Caroline since April 1994 (18 years) which brings the total to 8 people with 10-35 years dedication to ESE and our customers. "We are really proud of the whole team here at ESE, it is an extension of my family, as I spend as much time at work as I do at home" said Simon.